Discussion in 'Fable III' started by sfroggy1, Aug 14, 2010. A Fable novel set to launch alongside Fable III this October will give readers access to a unique weapon in the game. The book, titled Fable: The Balverine Order, will be available to buy in both paperback and hardback according to listings on Amazon, with both including a code to download a unique weapon in the game when they release on October 7th. The game is due to follow up just over two weeks later on October 26th. 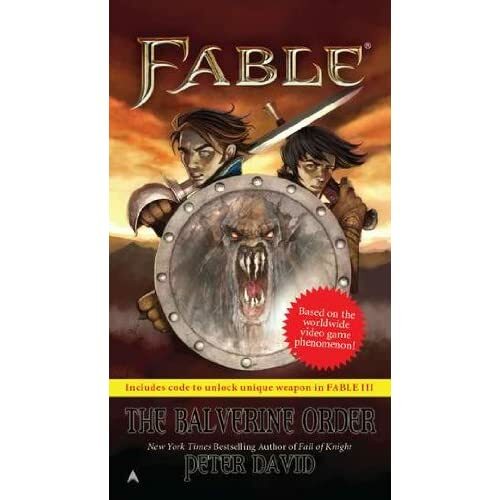 The novel's being penned by New York Times best-selling author Peter David, who, according to The Balverine Order's cover, also wrote Fall of Knight. We've no idea either.. There are no details on The Balverine Order's story as yet, but according to the blurb, the novel will "include an interactive element". Here's hoping it's something akin to the choose-your-own-adventure Fighting Fantasy gamebooks. If you don't know what they are, Google them - they're awesome. How many things are they gonna make us buy to get the full experience out of this game? Arrgh,thats true, I wonder where this book will fall in the timeline. Well if it goes to shops you could just take the code from the shelf. Not that I'd do that. But it says the code is in the book, so if it's on the shelf - open book, look at code, write it down, enter code. Its gotta be activated, and chances are by the time someone buys it, you won't know and they will input the code before you. Either that or the code's hidden somewhere on some random page, which forces you to read it. I might as well buy it. Yeah, free weapon plus a good read (hopefully) whats not to like? Benjamin510 God of rose returness. A dupe thread? Yes, yes it is. Yours don't have awesome pictures of Kermit the Frog in a trenchcoat bro. If you want people to read your threads, you've got to have a picture of Kermit in a trenchcoat. Yeah, maybe its our Hero adventuring with his first son. Oh I don't? Check again. I forgot how profiteering companies want to be. Ill get the book because it looks good, i've already ordered the LCE, and the villager maker code (if it ever arrives (had bad record with amazon shipping)) but i'm drawing the line at that. Ill wait till the controller is cheap on ebay and get it without the code.